Palmako Claudia 19.4m² Log Cabin: Palmako Claudia 19.4m² Log Cabin Summer House is an attractive Double Glazed 44mm log cabin with a large floor area (Footprint is 5.3m x 3.9m) . These log cabins are light and airy due to the large doors and windows. The Double Glazed Doors and Large Windows make this cabin an ideal studio or garden office. 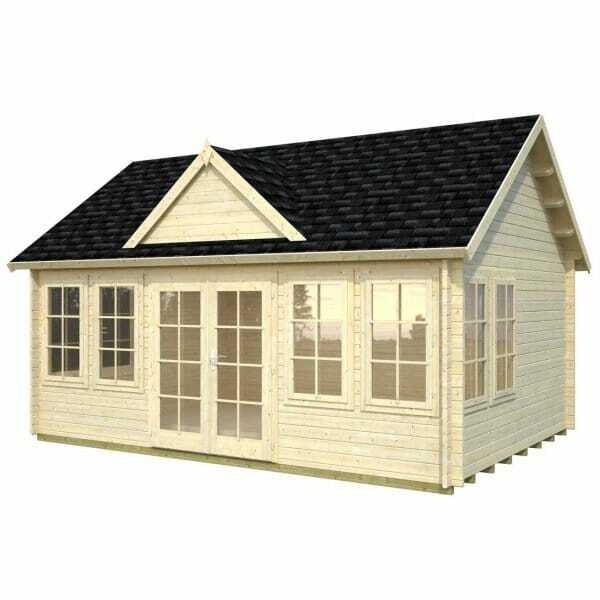 A superb addition to any garden, it features 44mm wall planks, full double glazed doors and 8 outward opening windows. The 8 x Single Windows (4 left handed and 4 right handed) are configured to give 4 x Double Windows.